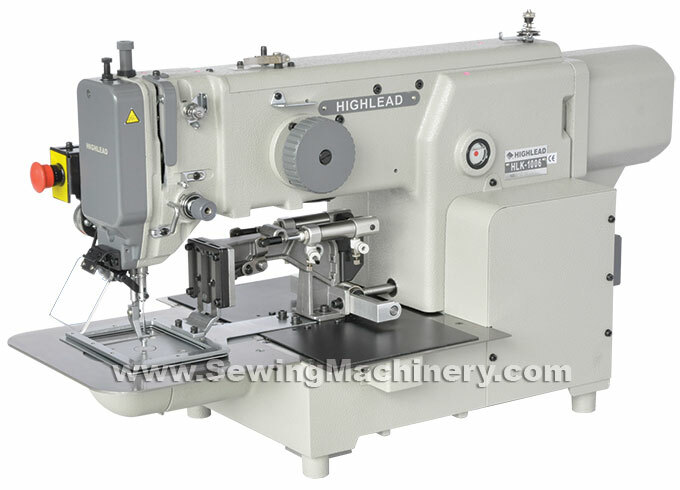 The Highlead HLK1006 is a versatile electronic pattern sewing machine for use in many different sections of the textile & clothing industry, with a useful programmable sewing area of 100mm x 60mm. 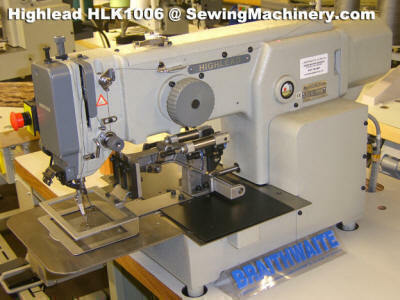 This HLK model features a Direct Drive system with a servo motor fitted as part of the sewing machine head; this improves sewing acceleration while greatly reducing power transmission losses and results in energy savings of up-to 40% when compared with conventional machines. Sewing patterns, stitch numbers and stitch length etc., can be set with-in the sewing area using the included hand held programming unit which features a clear LCD colour screen and an easy to follow advanced icon driven menu system. (2014 onward models now feature an upgraded touch screen programmer with full version programming software as standard). Sewing patterns are displayed onscreen including number of stitches, size, scale, location etc., which allows for easy adjustment and editing. The adoption of the universal serial bus (USB) makes programming, updating and storage easier. Inexpensive USB memory sticks are readily available. The clamping frame has a high lift of 25mm and is air operated to securely hold material in place ensuring a consistent feeding action. A central stepping foot securely holds the material around the needle during sewing operations, reducing skip stitching and thread breakage, for improved stitching results. By utilizing the stepping foot and air operated open type clamp; more custom programmes can be sewn without the cost and time of making a new clamp for every programme. 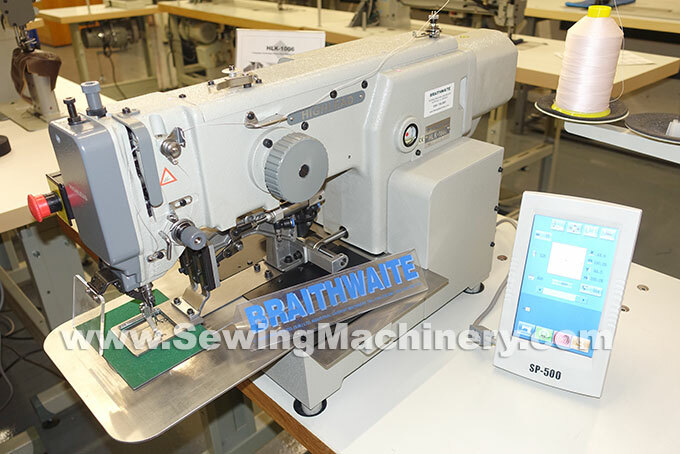 Sewing speeds up-to 2500 stitches per minute are available and the pneumatic work clamp has a high 25mm lift with a stepping presser foot movement of up-to 16mm. Minimum stitch resolution is 0.1mm with a maximum stitch length of up-to 12.7mm. 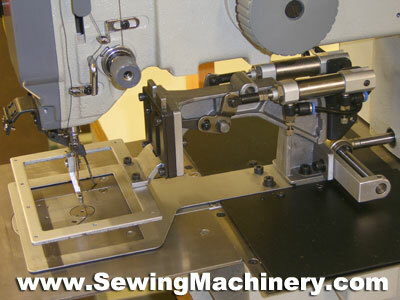 Example sewing applications include: belts, harness, straps, label attaching, box & cross, tacking, reinforcing, circle patterns and many other repeated stitching operations. Standard open frame clamps included Optional & custom made clamps can be fitted with-in as little as 10 minutes. 2x air cylinders secure the work clamp in place for improved material grip pressure. Both cylinders can operate independently allowing separate left & right clamp options. 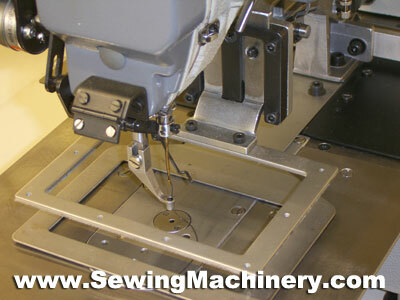 HLK-03 Electronic bartack sewing machine. Programmable 30mm x 30mm area with Mitsubishi computer control. HLK-0504 Electronic pattern sewing machine. Programmable 50mm x 40mm area with stepper foot & Mitsubishi PLK control.